Feeling cold? Warm yourself up with a steaming mug of Golden Mylk, a popular Ayurvedic drink that helps to improve your digestion and circulation. It's the perfect way to beat the Winter chill and can be enjoyed at any time of the day. If you'd have asked me five years ago whether I'd be settling down on the sofa with a mug of almond milk that's been prepared with turmeric, I probably would have thought you were mad. 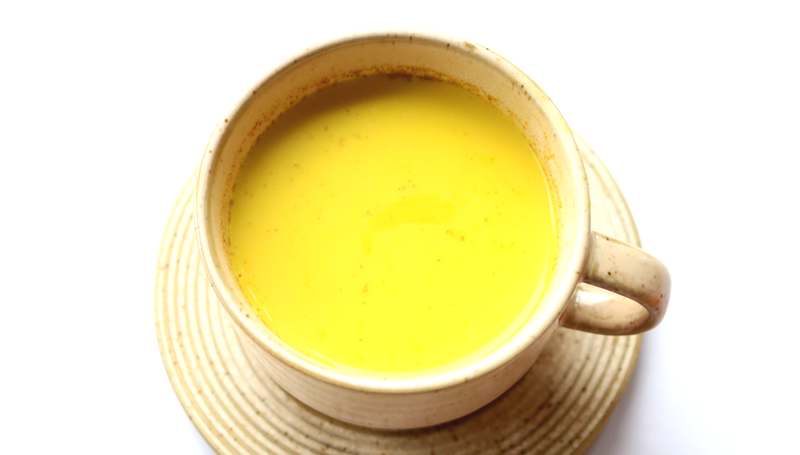 On the outset, I'm sure it sounds a little strange, but Golden Mylk (also known as Turmeric Latte), is one of the most deliciously comforting, caffeine-free drinks and it's good for you too! 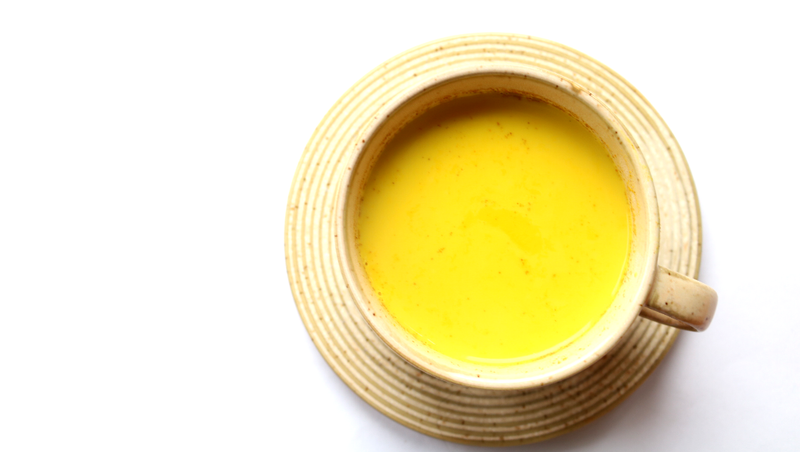 Turmeric has been used for centuries thanks to its well-known anti-inflammatory properties which are found in its Curcumin compounds, and Golden Mylk is a great way to get some of this beneficial spice into your everyday diet. Adding some Black Pepper helps the body to absorb the Curcumin much easier, and all of the other spices add their own unique properties and flavours into the mix. This is the first recipe that's featured in Jasmine Hemsley's East By West cookbook which I bought myself for Christmas, and I highly recommend picking up a copy if you're interested in Ayurvedic cooking or are just looking for something different to try. If you eat dairy, you can make this with organic whole milk, but it's just as tasty, if not more so, when made with Almond Milk instead. Place the Almond Milk in a small saucepan and add 60ml of water. Add all of the remaining ingredients, apart from the Jaggery, and gently simmer for 10-15 minutes. Add a splash more hot water if needed and then stir through the Jaggery to taste. Strain and serve in your favourite mug. Shopping tip: If you haven't come across Jaggery before, it's made from raw, unrefined sugar cane juice and is sold very cheaply in cones or blocks. It has a delicious caramel/molasses flavour and can be readily found in Asian shops, larger supermarkets that have a world food aisle, or purchased online. Avoid buying the granulated kind that's found in health food shops as this has more than likely been chemically treated to stop it from clumping. 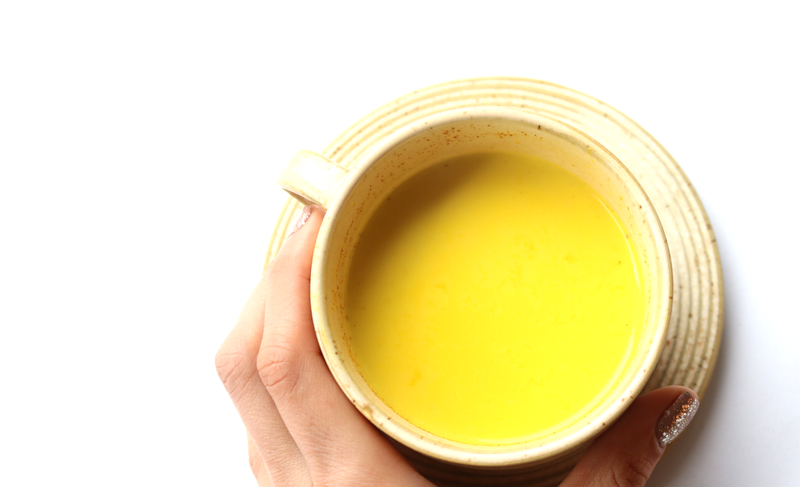 Have you tried a Turmeric Latte before?